The 60th anniversary tour of the World's longest running play continues on as the London production approaches its 62nd anniversary in a production that is both nostalgic, classy, humorous and intriguing. 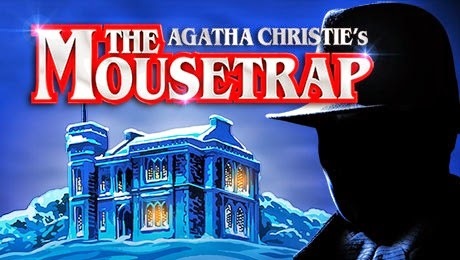 Whilst there are those who lament the continued success of "The Mousetrap" (yes, seriously) it remains one of the prime examples of the talents of Agatha Christie who, whilst never considering herself a great writer, never failed to create a puzzle that would capture the imagination of her readers and audiences. Of course the play's plot and dialogue is of a certain period but that is part of its charm and the cast handle it very naturally whilst inhabiting a physical production with ease and energy. True, the play is the epitome of the country house whodunit, but ask yourself; so what? What is wrong with that? The attraction of the play is the conundrum that Christie presents in a world inhabited by ebullient characters that the audience clearly enjoy watching. It is no crime (pun intended) to be entertained by something that never pretends to be anything but frivolous fun. So successful is Christie in her plotting that the final reveal still elicits gasps from the audience. She is, no doubt, aided by the crisp direction of Ian Watt-Smith and his excellent cast, amongst whom there is no weak link. It is difficult to single out any one performer in such a strong ensemble and so I shan't. I shall instead say that Helen Clapp, Michael Fenner, Christopher Gilling, Luke Jenkins, Anne Kavanagh, Charlotte Latham, Henry Luxemburg and Stephen Yeo work very well together and inhabit their characters in a very natural way, utilising Christie's sometimes heightened language in a most appropriate manner, rendering what could be performed in a clichéd, hammy way into something that belongs far more in the realm of realism. Indeed it is only Christie's epilogue that breaks that illusion, but this is a minor quibble. There must be a reason why the play has been so successful and you could do worse than to find it out for yourself. Read our Exclusive "Whodunnit" feature on The Mousetrap.